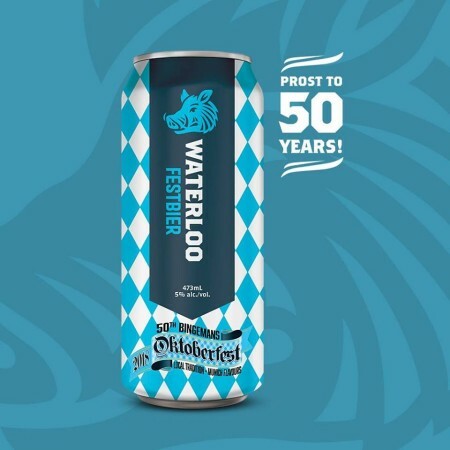 KITCHENER, ON – Waterloo Brewing has announced the return of a seasonal Oktoberfest beer that debuted last year as a local release, and will now be available across Ontario. As with last year’s edition, Waterloo Festbier will be a featured beer at the Bingemans Oktoberfest Kool Haus festhalle during the Kitchener-Waterloo Oktoberfest on October 5th-6th and 12th-13th. 2018 marks the 50th year that Bingemans has taken part in the annual festival, and the packaging of the beer commemorates the milestone. Waterloo Festbier will also be available in 473 ml cans at the Waterloo Brewery retail store, and LCBO and grocery store locations throughout the province. For more details, see the full release announcement.